NBC is tackling Ira Levin's iconic novel Rosemary's Baby. Even if you haven't read the book, you've more than likely seen Roman Polanski's 1968 film with Mia Farrow. The latest adaptation will be transformed into a four-hour miniseries starring Zoe Saldana as the mother-to-be. Rosemary's Baby centers on a couple who move into a Paris apartment that has a dark and storied past. Once Rosemary becomes pregnant, she notices strange occurrences that make her doubt her husband and overly concerned neighbors. It seems like everyone has ulterior motives when it comes to her unborn child. Production on Rosemary's Baby is slated to begin filming later this month. The screenplay is from Scott Abbott (Introducing Dorothy Dandridge) and James Wong (American Horror Story). 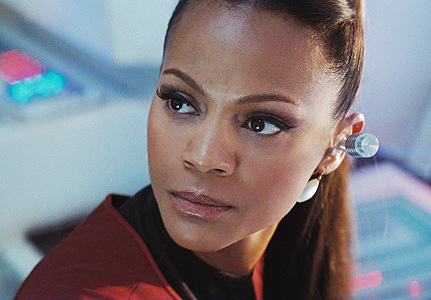 Saldana previously appeared in Star Trek Into Darkness, and recently wrapped Marvel'sGuardians of the Galaxy. What do you think of Saldana becoming the new Rosemary?